Hearing Health in Evans Mills provides high quality hearing aids and the latest digital hearing technology. Customers have come to rely on our commitment to client satisfaction. We provide free hearing evaluations using the latest video otoscope technology. Using a tiny video camera, a hearing instrument specialist will look inside your ear canal to determine if there is a hearing loss. Call to book your appointment with one of our hearing specialists. Our hearing evaluation will help determine if you have a hearing problem or if it is just ear wax. Based on what we find we are able to offer you unique solutions to fit your needs. Nick is 2013 Graduate of the University of Pittsburgh, where he earned a degree in Communication Sciences and Disorders. He currently resides in Evans Mills, New York. 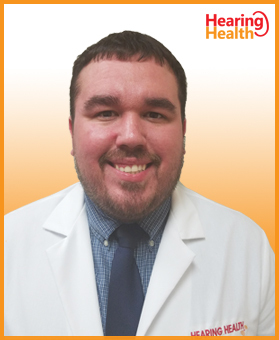 He has been a licensed Hearing Instrument Specialist since the fall of 2017. He is certified in all audiometric testing, as well as being well versed in hearing aid fitting, programming, and maintenance that is required for the digital hearing aids used today. “The reason I chose this field was I felt this was a great way to help individuals as well as making a positive impact in their lives. Communication is so important, and to be able to help and improve my patients hearing health and ability makes what I do so rewarding. I’m excited to come to work every day and help the next patient with their hearing challenge.